My lil’ Ms. GJG loves poking her nose. It has become a habit of hers, to remove boogies. She’s prone to allergies so she secretes more mucus than most kids. She’s so used to wiping her nose by herself she’s mastered rolling a tissue to stuff in her nose (dada’s teaching of course heehee). So when 3 Busy Bees, the Philippine distributor of Boogie Wipes gave me samples (c/o Tin Dychiao, thank you Tin!) I was excited for Gabbie to try it! Boogie Wipes is gentle saline wipes for stuffy noses. It is made with natural saline, dissolves boogies (mucus) caused by common colds or allergies. Developed by moms tired of chasing runny noses, Boogie Wipes provide an extra soft, hypoallergenic and alcohol free alternative to dry tissue or regular baby wipes. These wipes are suitable for all ages and gives immediate relief from common cold. I was able to try Boogie wipes over the weekend as lil’ Ms. GJG suffered from flu and runny nose. She loved using it as she would wipe her nose by herself (yes, she feels all grown up) usually with tissue or regular wipes. Her nose eventually turns red, dry and irritated from all the wiping, but with Boogie wipes there were no signs of irritation. Hooraaay! She loved the grape scent (the purple one) more than the unscented and fresh scent. Now even when she’s recovering from flu, she’d still ask me for Boogie Wipes whenever she needs to clean her nose. Bye bye tissue! heehee. Look at my feverish baby girl enjoying using Boogie Wipes despite being sick. 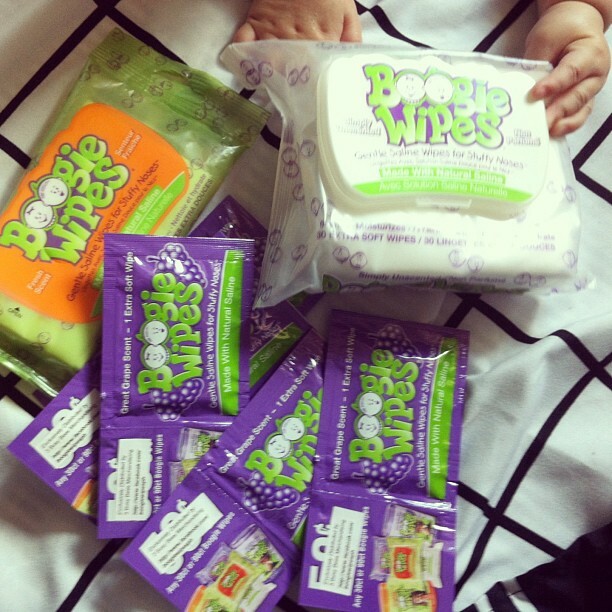 I recommend Boogie wipes for all mommies and daddies for their kids to use and enjoy. They’re best to clean runny nose and even dried out boogies. Boogie Wipes are available in 30 ct Flex pack (which can fit perfectly inside a diaper bag) at SRP of 299.75 php, a 90 ct Canister (perfect for home use) at SRP of 749.75 php and soon to available in 10 ct Travel pack at SRP of 119.75 php. Boogie Wipes can be purchased at http://www.zalora.com.ph and at Toys R Us Robinsons Galleria, Trinoma Mall, Eastwood Mall, Shangrila Mall, Glorietta, Greenbelt 5 and Bonifacio High Street. For more information like Boogie Wipes on Facebook and follow them on Twitter.